One of the treats I had growing up in Manila in the late 80s was to visit a restaurant called Kimchi, a Korean restaurant similar to the California fast food chain Yoshinoya. They had two main specialties: BBQ Chicken and “Korean Beef,” a stew of the most tender short ribs swimming in the rich thin sauce that was dark, sweet, and slightly hot, topped with chopped scallions and sesame seeds. It was my favorite but was twice as expensive as the barbecued chicken I often settled for. The chicken was good in its own right but did not provide the same kind of close-your-eyes flavor explosion as the sesame short rib stew. The Korean Beef’s sauce was good enough to fight for and drizzle on unlimited bowls of rice. It was so delicious and multi-faceted that never in my wildest dreams did I think it could ever be replicated in any home kitchen, much less in mine. Fast forward to a couple of decades and a whole continent later, I made my first attempt based on an old recipe I found online, and after years of trial-and-error revisions, now I get to share my version with you! Enjoy! We begin by placing the short ribs meat-side down in a good pot. Add all the other ingredients: one whole sliced onion, one head peeled garlic, one chili pepper, bay leaves, and peppercorns. Add the sugar. Don’t be shy. Add equal parts soy sauce and water. Simmer on low heat covered for about 2 hours. And done. The meat is falling off the bone and has achieved an almost gelatinous texture. Roast some sesame seeds in a pan until brown. This releases the flavor of the seeds and gives it a nice roasted flavor when you bite on them. Try it! The secret of this stew is the slow cooking time. Keeping it in a low simmer allows the meat to soften without falling apart or burning, meshing with the flavors of the sauce. Here it is served with a topping of roasted sesame seeds and chopped scallions. Serve with rice. This sauce, I swear to God, is worth fighting for. I use the leftover sauce and pieces of meat in a noodle dish I like. Enjoy! In a good pot, combine all the ingredients except for the sesame seeds and the scallions. Simmer on low heat for two hours or until the meat is tender. Top with roasted sesame seeds and scallions and serve with rice. You can add some vegetables on the side at the last minute. Here I added broccolini, but choy sum and bokchoy would also work. Here are the leftovers served over vermicelli and a side of sauteed bokchoy. Incidentally, upon searching for the original source of this recipe to credit, I stumbled across a distant cousin of mine who actually obsessed about the same dish too! Here is her version. 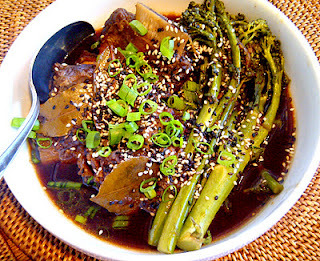 This entry was posted in cooking, homemade, Recipes and tagged beef on February 10, 2012 by admin.